There is a common misconception that the earth travels in an elliptical orbit around the sun, and that it is farther from the sun in the winter, thus the colder temperatures. Indeed, the earth traces an ellipse around the sun - as does Jupiter, Mars, and all the other planets. This is Kepler's first law, established in 1609, and proved 70 years later by Isaac Newton. That being said, the earth's orbit is pretty close to a circle. In fact all the planets have paths that are approximate circles. This is not a surprise. If a planet traveled in a long ellipse, it would cross the path of another planet, and within a few million years the two planets would collide, or they would influence each other gravitationally. If a solar system remains stable for several billion years, long enough for life to evolve, then its planets travel in approximate circles around the parent star. The earth is not substantially farther from the sun in winter - not enough to explain the change in the weather. And there's another problem. Winter in the northern hemisphere coincides with summer in the southern hemisphere - and summer in the north equals winter in the south. I spent the summer of 1989 in Botswana Africa, well below the equator, and of course it wasn't summer there, it was winter. Winter in July. I very much appreciated this, because I don't like the heat. The spring-like days and cool nights in the Kalahari Desert were fine by me. If the earth moved far from the sun, that would not cause winter in one place and summer in another. Instead, the entire planet would be colder. So some other mechanism is at work. You might have an Xbox, or a PlayStation, or a Wii at home, but I'll bet you don't have a top. I had one when I was a kid, a robust metal top that held up for many years. Press down on the handle, and the threads of the axial screw spin the top. The inner mechanism is ratcheted, so you can pull up on the handle and it does not engage the top. Press down again, this time faster, and the top revs up. Soon I was pumping as fast as I could, until the top was a blur, its pictures blended together into different colored rings corresponding to lines of latitude. The equator had four holes, and at high speed, air was sucked out through these holes. Each hole had a reed, like a harmonica. The result was a beautiful major chord. You had to get it going really fast to hear all the notes, a satisfying sound. As the top slowed down the notes would fade away one by one. The rings became a blur, then a flicker of images, then moving images, and finally the familiar stationary pictures as the top came to rest. I grabbed the handle and revved it up again. What does this have to do with the earth? A top is a good model for the earth, something that spins, something you can hold in your hand and turn as you walk around the sun. Of course the earth doesn't whirl at blinding speeds, if it did it would fly apart. But it does turn on its axis, like a top, very slowly, once a day. If you don't have a top then find anything that spins, or anything you can turn in your hand. Maybe an actual globe if you have one, so you can see the continents as we proceed. I'll call it a globe, though it may be a top, a basketball, or whatever you have around the house. Next you need something for the sun. A flashlight won't do, because it sends light in only one direction. A table lamp with a shade can be troublesome because the light is dispersed through and around the shade, and does not seem to come from a point source. An exposed bulb is perfect, if it isn't too bright. A naked night light perhaps, or even a candle if the rest of the room can be made sufficiently dark for contrast. Place your light at the center of a large round table. If you only have a square table, pretend like it is round. If your table is a long diningroom table capable of seating 8 or 10, remove the leaves and make it as round as possible. Remember, the earth's orbit is almost a circle. The light sits at the center of this table in an otherwise dark room, and the globe parades around the table in a circular orbit. At the same time, the globe spins. Looking down on the table is like looking down on the solar system from above, where above is defined somewhat arbitrarily as over the north poles of the planets and the star. Everything turns the same way, counterclockwise from our perspective. Pretend like you are a fly on the globe and turn it counterclockwise, and notice that the sun rises in the east, as it should. In the same way, the planets revolve around the sun counterclockwise. You need to walk around your table counterclockwise, with the globe in your hand. If you were doing this in real time, you would turn the globe once a day, and walk around the table once a year, but we don't have that kind of time, so we're going to speed things up a bit. Draw a line on your globe from the north pole down to the south pole, passing through Greenwich England. This is the prime meridian, longitude 0 in our latitude longitude system. Imagine yourself in Greenwich, sitting on the prime meridian, and looking up at the sky. Also imagine there is no sun. The earth exists alone in a sea of stars. Yes, the earth would be a frozen ball of ice, but let's pretend like there is some other way to keep it warm. You are responsible for marking time. What do you do? You've noticed that the stars circle around the earth. Maybe you still think the earth is the center of the universe. Maybe you still think the earth is flat. That's ok for now. You decide to define a day as one rotation of the celestial sphere. You could focus on any star, but Betelgeuse is your favorite, a bright red dot that stands out in a sea of stars. With as much precision as technology will allow, mark the exact time when Betelgeuse passes directly over the meridian, then mark its next passing. The difference between these two events is called a day. That makes sense - a day is one rotation of the sky. As it turns out, we do mark time from star to star. This is called a stellar day, a day by the stars, and by our clocks it is 23 hours and 56 minutes long. (23:56:04.1 to be precise.) It is also called a sidereal day - though the two days, stellar and sidereal, differ by 0.0084 seconds for reasons that are beyond the scope of this article. So why isn't it 24 hours long? Let's bring the sun back in and find out. Place the globe at the rightmost point of your circular table, with the prime meridian facing left. Remember that the sun sits at the center of the table. A miniscule earthling, sitting on the meridian, sees the sun at its zenith. It is high noon. With the sun back in the picture, a day is now defined as noon to noon. It is no longer defined as star to star. The sun is more important than the stars. So wait patiently, and mark the next occurence of high noon. That is a day. I'm going to describe the day in three steps - although it occurs in one smooth motion in the actual solar system. (1) Spin the earth once around, a stellar day lasting 23 hours and 56 minutes. The meridian faces left, as it did before. The meridian faces the sun, as it did before. Perhaps a particular star also hangs directly over the meridian, a star that you are tracking. Call this star Arcturus. After a stellar day, Arcturus is once again over the meridian, as it was before. You can't see it because of the sun, but trust me, it's there. However, during those 23 hours and 56 minutes, while the earth turned, it also moved around the sun, so (2) carry the globe a couple centimeters around the table, traveling counterclockwise. This is the second step. Arcturus remains directly over the prime meridian, but the sun is not overhead any more. You have moved the earth around the table, and the sun has, from the perspective of Greenwich England, shifted to the east. The earth has to turn a little bit more to put the sun directly overhead. This is the third step. (3) Rotate the earth for another 4 minutes, moving Arcturus off the meridian and placing the sun directly overhead. That's a solar day, and it is 24 hours long. Of course the solar day was divided into 24 hours long ago, because the sun rules our lives, and we like the number 24. An hour is 60 minutes long, and a minute is 60 seconds long, because we like the number 60. The ancients liked numbers with a lot of factors, as these are easily divided into fractions. A quarter hour is 15 minutes, and so on. With the solar day set at 24 hours, the stellar day is 23 hours, 56 minutes, and 4 seconds. We have to be a bit careful here, because the orbit is not a perfect circle. Almost, but not quite. Suppose the earth is a tad closer to the sun. Less potential energy means more kinetic energy, (by conservation of energy), thus the earth is moving a little faster around the sun. After a stellar day, the sun is east of the meridian as expected, but by a little more than its usual 3 minutes and 56 seconds. The earth has to turn a bit more to line up with the sun, and hence the solar day might be 24 hours and 8 seconds long. On the other side of the orbit, when the earth is moving slowly around the sun, it hasn't traveled as far out of position after a stellar day. The sun's shift away from the meridian is not as great. The solar day might be 8 seconds shy of 24 hours. But on average, a solar day is 24 hours long. We have declared it to be so. The second has been carefully defined so that a year's worth of seconds, 60 times 60 times 24 times 365, causes the sun to cross the meridian precisely 365 times. Some days the sun crosses the meridian a hair before noon, some days a hair after, but it all works out. Most of this precision was established by medieval measurements, long before modern technology. It's amazing what humans can do when they're not fighting each other. It would be quite a coincidence if the year was an exact number of days. Start the earth on the right side of the table, with its meridian facing left, and let it spin, and revolve around the sun. When it gets back to start, at the right side of the table, is the meridian going to be precisely lined up with the sun? Not likely. In fact the meridian is facing you. Our year is 365 and one quarter days long. Well what if we just left the year at 365 days? The start of each new year would slowly march clockwise around the table, and after a few centuries summer is in February instead of July. That's just plain awkward, so instead we add a day to every fourth year, i.e. every year divisible by 4. That extra day makes up for the four quarter days accumulated by the four circuits around the sun. The fourth year is called leap year, and the extra day is leap day, February 29. It would be an amazing coincidence if a year, one trip around the sun, was exactly 365.25 days. It's close, surprisingly close, but not exact, so more calendrical adjustments have been made. Each year divisible by 4 is a leap year, except for those years divisible by 100, unless that year is also divisible by 400. Thus 2000 was a leap year, but 2100 will not be. This should keep the years and the days in sync for quite some time. so far we have not addressed the question at the top of this article, the reason for the seasons. the trick is to tilt the earth. In fact, it would be an amazing coincidence if the earth's axis was straight up and down relative to the orbit around the sun. With the globe at the right edge of your table, tilt the axis 23.5 degrees to the left. The earth leans in towards the sun. It is summer in England, and if the lighting conditions are right in your diningroom, this is clearly visible. Europe is bright, i.e. well lit, while South Africa receives sunlight at a shallow angle, and is not as bright. Light equals heat, thus England is warm, and South Africa is cool. Keep the axis tilted and gently spin the earth. The countries in the northern hemisphere all receive plenty of light, and appear bright, while the southern countries only receive a little light. It is helpful if your prop is an actual globe in a stand with the appropriate tilt built in. These can be purchased from a store or online. Keep the earth's axis pointed up and to the left, always towards the north star, and carry the earth halfway around the table. It is now at the left edge of your table, and leaning away from the sun. Spin it gently around and note which countries receive most of the light. It is summer in the south and winter in the north. Australians enjoy warm days on the beach. Cary the globe back around the table and complete the circuit, so that it is summer in the north once again. This is a year of seasons. A curious thing happens in summer, near the North Pole. Place a dot on Qaanaaq Greenland. This is you; this is where you live. You and 655 other brave souls. Turn the earth so that Greenland faces the sun. The sun is not straight up in the sky, but it is a respectable 36 degrees above the horizon. Now spin the earth around, so that Greenland is on the night side. But it isn't night at all. Light from the sun still reaches Qaanaaq. If you live in Qaanaaq, the sun does not set. It is still 11 degrees above the horizon. For a month it traces a circle in the sky, climbing up during the "day", and dipping down towards the horizon at "night". This is the land of the midnight sun, and the same is true of many northern cities in Alaska, Canada, Norway, Sweden, Finland, and Russia. When the sun travels around you in a circle, then, for part of that time, it must necessarily move from west to east. Yes, there are places on earth where the sun moves from west to east, for a short time, relative to your location. The flip side of this lovely spectacle is winter. Carry the globe around to the left of the table once again, keeping the earth's axis tilted left. At the peak of winter, Qaanaaq is in darkness all the time. It has become the land of the noonday dark, and there isn't much to do except ride it out, and look forward to summer, when the sun circles the sky once again. Each planet has its own tilt, defining its own seasons. The most interesting example is Uranus, with a tilt of 97.77 degrees. For purposes of illustration, let's call it 90 degrees. With your globe at the right edge of the table, tip it over until the north pole points directly at the sun. This is a representation of Uranus in the summer time. (Of course Uranus is always cold, summer or winter, being so far from the sun, but you get the idea.) An astronaut, stationed at the north pole, sees the sun directly overhead, all day. And it remains there for quite some time, because Uranus moves very slowly around the sun, making a circuit every 84 Earth years. If the astronaut is in a location comparable to Germany, the sun traces a small circle in the sky. At the equator, the sun is always on the horizon, and south of the equator it's dark, nothing but stars. Although this picture may persist for several years, Uranus does move. Pretend like 21 Earth years have passed, (apparently astronauts who go to Uranus are there for life), and carry the globe around your diningroom table to the back, always keeping the north pole pointed left. Now the equator touches the table, and conditions look more like earth. Spin the globe, and our astronaut experiences day and night, no matter where he is on the planet, though his day is just a bit shorter than ours, lasting 17 hours and 42 minutes. Now walk around to the left of the table, and the northern hemisphere falls into a deep dark winter, while the southern region becomes the land of the midnight sun. Finally travel back around the table to complete the circuit and the rather unusual seasons of Uranus. Unfortunately an astronaut can expect to experience all these seasons just once, and then his 84 years of life are over. If it were me, I'd move to the "other" hemisphere for the second half of my life, so I did not have to spend 42 years in darkness; either that or build a base camp at the equator. Granted, the sun is not as impressive this far out; it is only 1/400 as bright as it appears on earth. Still, it is 1,000 times as bright as our full moon, so a sunny day, or a sunny decade, is definitely appreciated. Ok, it's time to come back to earth. Tilt your globe back up to its former 23.5 degree slant and walk around the table once again. Stop at the back, when the equator just touches the back edge of the table. This is the equinox, latin for equal nights. Spin the earth, and day and night are each 12 hours long, no matter where you are on the planet. Every planet has an equinox, as illustrated by Uranus in the previous section. It occurs when the equator lines up with the sun. In fact every planet has two: at the back of the table and at the front of the table. The one in front is called the vernal equinox, and is, by definition, the start of spring. This is more than the first day of spring, it is the first moment of spring. As the globe moves around to the right side of the table, the days get warmer, at least in the northern hemisphere. The equinox at the far side of the orbit is the autumnal equinox, marking the first day of autumn. Days get colder after that, all the way to winter at the left. Of course the equinoxes are somewhat misnamed for those who live in the south. The vernal equinox is the start of autumn, and the autumnal equinox is the start of spring. Year after year, the earth travels around the sun, and in our illustration, the equator touches the front of the table, marking the start of spring. Why isn't this the same time every year, or even the same day? It usually happens on March 21, but sometimes March 20 and sometimes March 22. This is a consequence of our calendar, rather than astronomy. Suppose, on one particular year, the vernal equinox occurs at precisely noon on March 21. The meridian, that special line that runs through England, is facing the sun when the equinox touches the table. In other words, both the equator and the meridian touch the front edge of the table at the same time. Let a year go by, so that the globe is once again at the front of the table. A year is 365 and one quarter days, so this time around the meridian is facing left. The vernal equinox occurs at 6 PM on March 21. The next year it advances by another 6 hours, more or less, and could well wind up on March 22. Of course it does not drift forward forever; we have designed the calendar to make sure that doesn't happen. A leap year comes along and adds in another day, and now the equinox is back on March 21 where it belongs. Sometimes it even occurs at the end of March 20, just after a leap year, before it starts jumping forward again. The autumnal equinox bounces around September 23 in a similar fashion. Why are there 186 days between the vernal equinox and the autumnal equinox? That is at least two days more than half a year. Because the orbit is not a perfect circle. The globe moves a little slower around the right side of the table, and a little faster around the left side of the table. The ellipse carries the earth justa little farther out on the right. Many people in the northern hemisphere are surprised to learn that the earth is a little bit farther from the sun in the summer than in the winter, but again, the tilt determines the seasons. The change in orbital distance is too small to affect the weather. If your globe is in fact a proper globe, or a basketball, set it down and look around for a top. You want something that spins fast. A gyroscope would be even better. If you don't have one, run out and buy a Wizzer, a self-contained gyroscopic toy that you can rev up to high speeds in just a few seconds. Roll the rubber tip along the floor, and a metal flywheel spins rapidly inside the plastic housing. Believe me, I spent many hours playing with my Wizzer when I was a kid. Hmm - that didn't sound right - let me rephrase. When I was a kid, the Wizzer® provided hours of entertainment. The toy is also educational, as it illustrates the principles of a gyroscope. Try to turn the axis of rotation when the wheel is running at high speed, and notice that the toy jumps to the side. The axis of rotation wants to remain fixed in space. That is why gyroscopes provide stability to almost all spacecraft, and even submarines and airplanes. Point the axis of a gyroscope in a particular direction and it will stay there, unless disturbed by friction or other forces. When a force does try to push the axis out of alignment, the flywheel moves perpendicular to the force, i.e. it jumps to the side. Spinning objects are strange indeed. The earth does not spin fast, but it is massive. The axis of rotation is not going to change. To first approximation, the north pole points to the north star, and it always points to the north star, even as the entire planet revolves around the sun. Nothing is going to disturb the axis of rotation of something as massive as the earth, and yet something does. Before we explore this astronomical force, find a wizzer, or some other gyroscopic toy, rev it up, and notice how easily you can move it around the room, provided the axis of rotation does not change. However, try to turn the axis, and the toy practically jumps out of your hand like a wild animal. This is the insight we need as the sun and moon act upon the earth. Pretend like the earth is a perfect sphere. It still spins about its axis once a day, but it is perfectly round. The axis can point in any direction, straight up, or towards the sun (like Uranus), or somewhere in between, and the potential energy of the planet within the gravitational field of the sun is unchanged. It's a sphere no matter how you orient it. If one side was heavier than the other, then that particular side would roll around towards the sun, but that's not the case. The axis has no particular preference. Well the earth is not a perfect sphere. I'm not talking about mountains and valleys; they are too small to matter. I'm talking about the overall shape of the earth. It has an equatorial bulge. The distance from the center of the earth out to the equator is about 20 km greater than the distance from the center to either of the poles. The equator bulges out just a bit. This is because the earth spins. When anything spins, the outermost parts are pulled away from the center. Twirl around with your arms outstretched and see. Thus the spin pulls the equator out by a few kilometers. It doesn't sound like much, a change in diameter of just 0.3%, but it makes a difference. Think of the earth as a perfect sphere with a ring pasted on to the equator. The ring is the equatorial bulge. There are no precessional forces acting on the sphere, so we only need ask how the sun interacts with the ring. Place your globe at the right edge of the table, summertime in the North. The equator, i.e. the ring of material that corresponds to the equator, dips down below the table on the sunward side of the globe, and rises up above the table on the dark side. The ring is tilted relative to the orbital plane by 23.5 degrees, just as the axis is tilted to the left by 23.5 degrees. If you tip the ring back up into the orbital plane, level with the table, that represents a decrease in gravitational energy relative to the sun. This seems strange at first. The left edge of the ring rises up, and in so doing, moves a little closer to the sun. That is definitely a lower energy state. Things like to roll "downhill" in a gravitational field. At the same time, the right edge of the ring moves down and away from the sun, like pulling tons of material uphill. The left edge moves down (towards the sun), and the right edge moves up (away from the sun). Don't they cancel each other out, like a teeter totter? Not completely, because gravity falls off as distance squared. The left edge of the ring is closer to the sun, and moves through a stronger gravitational field. The right edge of the ring is farther from the sun, and moves through a weaker gravitational field. As the ring pivots to reach the orbital plane, the left edge releases more potential energy than the right edge consumes. It is a bit like a teeter totter where one child is slightly heavier than the other. Therefore the sun exerts a net force on the earth, trying to pull the equatorial ring back up into the orbital plane. 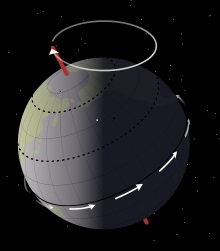 Of course the ring is attached to the earth, so as the ring pivots up towards the orbital plane, the axis straightens up towards the vertical. In summary, the sun is trying to straighten up the earth. Walk around the table and place the earth on the left, i.e. winter in the north. Look once again at the ring, and note that the sun is trying to pull the near edge of the ring down towards the orbital plane. This pulls the axis towards the vertical. Once again the sun is trying to straighten up the earth. This rectifying force exists, to varying degrees, all along the earth's orbit. Day by day, year by year, the sun is constantly trying to straighten up the earth. If the earth didn't spin, then it would simply straighten up. But it does spin, like the flywheel inside a gyroscope. when a force is applied to the spinning ring, it moves to the side. The axis does not move towards the vertical, it precesses, defining a cone about the vertical of 23.5 degrees. This precession is slow, completing a cycle every 26,000 years. Let's take a snapshot of the earth every time it is at the right edge of your table. At the start, the axis tilts left at an angle of 23.5 degrees. Years go by, centuries go by, and each year we snap a picture of the earth at the right side of the sun, like time lapse photography. The axis of rotation is moving - the north pole is moving. In 5,500 years, the earth is tilted away from you. The north pole is leaning towards the back wall. In another 5,500 years the axis is tilted to the right. In another 5,500 years the axis is tilted in your direction, the north pole clearly visible, and in another 5,500 years the axis is tilted, once again, to the left, where it started. So far I have not mentioned the moon, but it also tries to straighten up the earth through the same mechanism. The sun and the moon combine to precess the axis of rotation. If the moon was not there, precession would be much slower, taking perhaps 80,000 years to turn the axis around in its cone. As the earth's axis turns, the equator turns with it. (As we saw above, the force is actually on the equator, not on the axis.) When the equator turns, that changes the equinoxes by a few minutes each year. This was detected and measured by astronomers well before its mechanism was understood. The explanation of this precession was a triumph of Newton's theory of universal gravity. As a practical consequence of axial precession, Polaris was not the north star 2,000 years ago, and it won't be the north star 2,000 years from now. In fact, Gamma Cephei will be the north star in the year 4,000. Believe it or not, the calendar takes precession into account. Several centuries from now, summer will still start on June 21, even though the axis points in a slightly different direction, and summer now begins at a different point along the earth's orbit. In 5,000 years the axis will lean away from you, relative to our illustration, and summer will occur when the globe is situated at the front of the table. Still, summer will start on June 21. The calendar is designed to drift, very slowly, in step with the precession of the equinox. When you ask someone for today's date, or the correct time, centuries of astronomical observations and careful mathematics stand behind the answer.